Part 1 Introductory issues: Consumers and functional cereal products; Labeling and regulatory issues related to functional cereal products; Fiber, whole grains and disease prevention; Resistant starch and health; Micronutrients in cereal products: Their bioactivities and effects on health; Whole-grain consumption and insulin sensitivity; Determining the functional properties of food components in the gastrointestinal tract. Part 2 Technology of functional cereal products: Improving the nutritional quality of cereals by conventional and novel approaches; Novel high fibre and whole grain breads; Oat bread and other oat products; Rye bread and other rye products; Functional barley products; Products containing other speciality grains: Sorghum, the millets and pseudocereals; Vitamin and mineral fortification of bread; Omega 3 enriched bread; Soy-enriched bread; Inulin in bread and other cereal-based products; High-fibre pasta products; Functional cereal products for those with gluten intolerance; Converting oats to high-fibre products for use in functional foods; Improving the use of dietary fibre and other functional ingredients to lower the GI of cereal products; Methods to slow starch digestion rate in functional cereal products. Cereal grains and their fractions contain many health-protecting compounds such as phytochemicals, vitamins and indigestible carbohydrates, but the texture and taste of functional cereal products can be less than ideal. This important collection reviews technologies for producing a wide range of cereal products with different health-promoting properties and more acceptable sensory quality. The first part of the book discusses the health effects of cereals, with chapters on topics such as whole grain foods, cereal micronutrients and resistant starch. Consumer perception of health-promoting cereal products and regulatory and labelling issues are also described. The second part focuses on technologies to improve the quality of functional cereal products, reviewing issues such as grain improvement, novel cereal-derived ingredients and formulation of low GI products. Chapters dedicated to a wide range of product types are also included, covering cereal foods made from oats, rye, barley and speciality grains and breads fortified with vitamins and minerals, soy and omega-3 lipids among others. 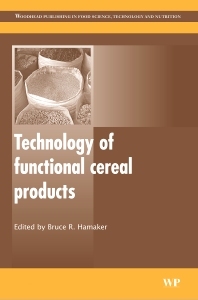 Technology of functional cereal products is an essential reference for all those involved in research and development of health-promoting cereal-based foods. Dr Bruce R. Hamaker is Director of the renowned Whistler Center for Carbohydrate Research at Purdue University, USA, where he is also Professor and leads the cereals laboratory. His work encompasses carbohydrates and health, starch and cereal chemistry, with diverse applications from the manipulation of starch digestion rate for low glycemic response to more appropriate utilization of cereals in developing countries.